One of the most exciting things about starting a new job is getting that first paycheck. Seeing all the hard work from the interview process to the first few weeks on the job pay off is such an amazing feeling. I remember just staring at my bank account and being so excited and then the harsh reality sunk in that I had no idea how to budget or if this was even the amount I was supposed to be paid. Choosing all the deductions like health care, flexible spending and life insurance policies make it extremely confusing to identify what your monthly take home will be. You want to go back and double check your offer letter to make sure that’s the amount before deductions listed on your paystub. If it’s not, reach out to your human resources representative for clarification. Next, you want to look through all the deductions. At a glance, make sure everything that you requested to be deducted was deducted. If you claimed life insurance, double check that it’s on the paystub and anything else you noted when you filled out your initial paperwork. Depending on the frequency of your pay, certain items might be taken out once a month versus every paycheck if you’re paid more than once a month. So be aware of this as you’re looking through your list. After you’ve identified that everything was deducted that should be or have items you need to mention to your HR rep, make sure the amount deducted was what was written in the documentation you completed. You don’t want to over or under pay for the benefits requested. Reexamine how you get your paycheck. Most companies nowadays do direct deposit and you determine which account you want to send it to when you fill out the initial paperwork. After you get your first payment, make sure it’s going to a bank that’s accessible to you now which might be different from the bank you used in college. Can you easily access and withdraw funds? Is there a location by you to go in and ask questions? Determine if where you’re sending your money makes sense for you at this point in your life and if it doesn’t, identify another banking institution that better suits your new lifestyle. Try the 50/30/20 rule for budgeting. This budgeting tactic helps you to identify specific areas to spend and save your money. This is a good place to start if you’re new to budgeting and want a simpler formula to follow. 50 (Needs): Identify the recurring bills and necessities you will have every month (rent, utilities, car payments, insurance, student loans, etc). This is where a majority of your income should be spent. If your rent or student loans are higher than this percentage think about getting a roommate and reaching out to your student loan company to see about temporary alternative payment options. The goal is to keep these areas at about 50% of your income. 30 (Lifestyle): Now this might be the first number to adjust if you’re finding yourself over budget or not able to pay your credit card bills left over from college. This is “extra” food, night out with friends, etc. Things that you want to do for your lifestyle. 20 (Goals): This can be additional money towards your student loans or credit card payments, saving up for a vacation, and increasing your emergency fund. Not all this money needs to go to one place and can be spread out among the percentage but this amount should be used towards saving. Now that you know when you’re getting paid, make sure your credit card and student loan payments line up with your paycheck. You don’t want your bills due before you get paid for the month. Take some time and call each company and adjust the monthly deadlines. Identify and update your retirement contribution. If you haven’t already, now is the time to take a portion of your paycheck and put in a retirement account. If your company matches your contribution or gives a certain percentage, make sure you have at least the minimum amount deducted from your paycheck for them to contribute. If you’re more financially stable, I would suggest contributing 10%. If you don’t have a savings plan, now is the time to take this big adulting step. You will want to start putting money aside for an emergency fund, travel expenses or anything else you want to save for. Without being proactive with identifying the amount to put aside, you’re likely to forget and spend it on extraneous things. This all goes back to the 20% portion of the 50/30/20 budgeting rule. Talk with a Professional About Your Credit Score. For most of my jobs I was only paid once a month and I remember getting my first paycheck and freaking out that the money wouldn’t last the entire month. Speaking with a financial advisor can be extremely beneficial to help make sense of your money and how to get the most out of it. Once you learn how to balance your money it might be worth looking into your credit score. 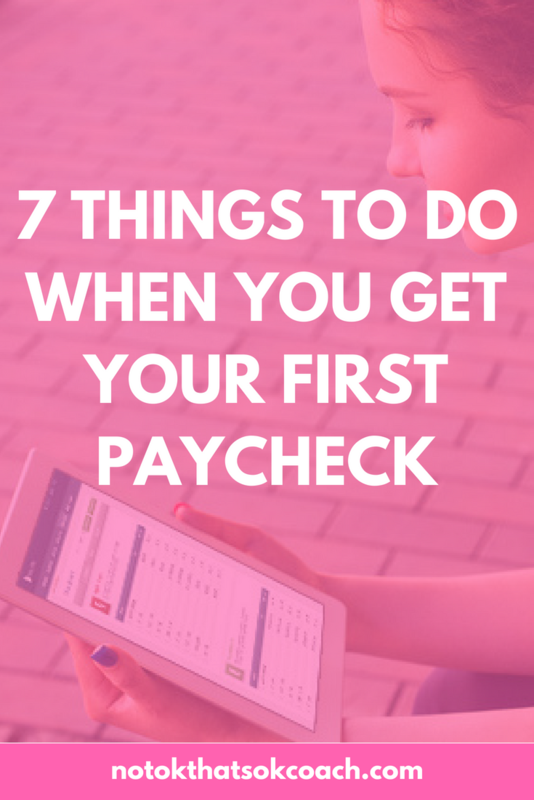 Navigating your first paycheck can both be exciting and nerve wrecking and you might be unsure of how to plan for the future, or potentially improve your credit score. You don’t have to go through this process alone. Lexington Law has not only articles on their site, but also has professionals there to help you repair your credit score that will in turn set you up for a brighter financial future.